Discover the fantastic landscape of the golden Aegean Coast of the Mediterrean Sea, with its sun, sandy beaches and cultural heritages as well as their natural beauties. While looking on the maps visitors may confuse Milet or Mylas. These names look smiliar but totally different places. Theres an nother place also named Akkoy is another village in the borders of Denizli Province of Turkey ewhere Pamukkale (also known as Cotton Castle). And between these two Akkoy there are about 300 Kilometres distance. Akkoy Village we are mentioning here is in the borders of Aydin Province near by the ancient city Milet.The name Milet (on some maps Miletos or Miletus are all the same) belonges to city near Balat Village today 3 miles (5 km) away of Akkoy village. Ilgüzer's Café Olive is situated in the village of Akkoy in the centre of the natural park of the Meander delta on the south - west coast of the Aegean Sea in the regional area of Izmir, in the department of Aydin and just 5 km away from the ancient town of Miletus, the centre of philosophy and the former capital of ancient Ionia. Ilgüzer's Café Olive is easy to reach from the main road from Soke in direction to Bodrum, When You come from Kusadasi or Izmir you turn right just after passing Soke Plain and River Meander (Menderes in Turkish) at the point where the signpost goes on the right to Didim( yellow signpost Didyma) from the main road. Let behind the first village of Akyenikoy and You reach the village of Akkoy until the road is dividing again into direction to ancient Miletus (Milet, Mileto, Miletos are the same names used for the city) on the right and Didim on the left. 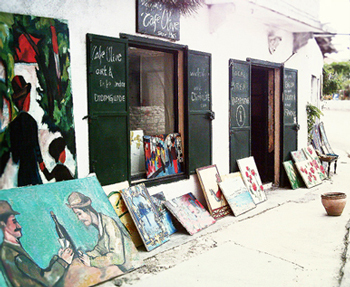 Our ArtCafe with our art gallery in the garden takes place on the left corner of this crossroad. Before Didim became popular with its sea side resort Altinkum, Akkoy used to be the biggest town in The Didim Region. People who have summer houses around Didim passing through Akkoy would stop for a tea break and discover the stone paved streets telling how old the village itself with its beautifully decorated old Greek Ottoman Houses not in a very good condition today. Apart from being the oldest village of the Didim region possesses great importance in terms of economy and agriculture. Thanks to continuing agricultural affairs. Akkoy which has got the Gendarme station and school in which pupils from nearby villages used to come in the early years of republic is now a district with 450 families and 1400 inhabitants and struggling for getting the right of being a town governed by a municipality, despite it's closeness to ancient Didyma and Miletos city Akkoy is a lovely village with it's intact village life, natural beauties, appropriate bays for fishing, its unexplored moreover is an example village for the others. Also the biggest village library of Turkey situates in Akkoy. Home made Village wine is available during the harvest season. A few people of Akkoy still produce their own wine.